Revelation 1:17-18 (RSV) – When I saw him, I fell at his feet as though dead. But he laid his right hand upon me, saying, “Fear not, I am, the first and the last, and the living one; I died, and behold I am alive for evermore, and I have the keys of Death and Hades. Have you ever been “locked out” of your very own house? I have. In 2004, I was back in Singapore for one month to renovate my apartment for Jan to stay as she had returned to Singapore that year to start her high school. 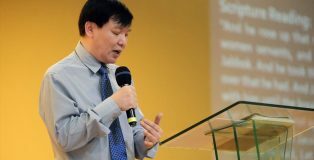 The sending church was not in favor of Pastor Toh Nee leaving the Iloilo Church without a missionary pastor for one month. Thus, this laborious task of renovation and cleaning up the house, buying new furnitures from Ikea, not mentioning the stressful time of driving Jan to and fro her school, fell upon my lap. It was the most physically draining time of my life to the point after my return from that renovation, I sustained an injured hip and spine and I had to undergo PT for 3 weeks. During the end of the renovation, I was so mentally and physically exhausted that I forgot to bring along my keys when I left my flat. 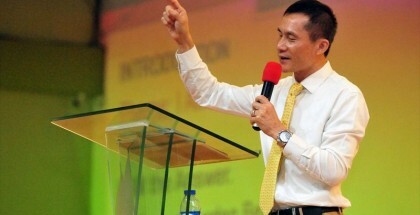 I remember that day – the day when I had to invite all the relatives of Pastor Toh Nee to my house for housewarming. My sister and her friend fetched me with all the pots of Laksa in the car. Jan was with me too. When we arrived, I searched frantically for the keys in my bag to my flat but I couldn’t find. Then I asked Jan, “Before we left the house, I told you to get my keys from the kitchen table. Did you take it?” She replied she didn’t hear my instructions. I was so furious and frustrated that I almost cried. There standing outside the door were pots of party food and worse was the eldest brother of Pastor Toh Nee arrived and was also waiting for me to open the door. But we were all foolishly and helplessly locked out… till I saw some stickers pasted on my gate by the locksmith. The telephone number was there and immediately I called them up. In less than 20 minutes, the locksmith arrived and with just one master key, he opened the door and we were able to enter into our house. That one key used by the Master Locksmith cost me $50. I was very amazed by the power of that one Master key used by the locksmith to open the door in less than 3 minutes. Wow! That master locksmith has that Master key that can open more than millions of locked doors in Singapore. But our Key Text mentions a greater Master Locksmith who has keys much better than my Singapore Locksmith. He has the keys of Death and Hades. This morning, I would like to share a sermon entitled – THE MASTER LOCKSMITH. • The Keys to Open our Hearts. Possessing the “KEYS OF DEATH” means the risen Christ has CONTROL AND AUTHORITY OVER DEATH. In John 10:17-18, Jesus says, “The reason my Father loves me is that I lay down my life – only to take it up again. No one takes it from me, but I lay it down of my own accord. I have authority to lay it down and authority to take it up again. This command I received from my Father.” When Jesus died, He died according to His own timing, when He “gave up his spirit” (John 19:30). Pilate was surprised to hear that Jesus was already dead (Mark 15:44). Jesus, who has the authority over death, had the unique power to give up His spirit and to rise from the dead. Moreover, He has the authority to release His followers from death in order that they may be with Him forever. Think of the concept of giving someone “THE KEY TO THE CITY.” This key is sometimes a large, cartoonish key that fits no lock but is symbolic of an HONOR BESTOWED. Someone given “a key of the city” is considered welcome and honored within that city. The Bible frequently speaks of keys as representing CONTROL OR AUTHORITY over something or someone. This concept makes sense – to possess a master key to a building is to have the authority to open any of its doors and enter any room. Isaiah 37:2 speaks of Eliakim, the son of Hilkiah, an honorable man sent on an important errand. In chapter 22, it was written that Eliakim would be given authority and that God would “place on his shoulder the key to the house of David.” A trusted servant to the king wore the key to the king’s house on a hook on his shoulder. By the “key to the house of David,” it is meant that the Lord would place Eliakim in a position of authority. Later, Eliakim becomes the governor of the palace in Jerusalem. In Revelation 9:1-2, an angel is given a key to, or control over, the bottomless pit, and he uses the key to open that pit. Later, an angel is seen locking things in the bottomless pit (20:1-3). Eternal life through Jesus Christ is the blessed assurance John describes in 1 John 5:6-13. In ancient Israel, the human king was in fact the steward of God, the true King of the land. Similarly, the divine Christ is the steward of His Father’s kingdom. With that authority, only Jesus can allow or disallow someone entrance into the Kingdom of God – but no man had or has that authority. So, when our key text declares that Jesus has the keys of death, it means He is the Master Locksmith who the Master Key of death and Hades – He has the power to release from death those who receive the gift of salvation He offers. Jesus has the keys of Death and Hades. He also has the keys to other things namely the keys to open our prison doors. For the Master Locksmith to use His master key to open our many locked doors, He needs our cooperation. If I had not called up the locksmith, my apartment door would still remain locked even though I know Locksmiths were available and effective in Singapore. While many of us will not experience landing in jail or locked in a prison cell, there are ways that our hearts can be taken captive and our minds locked up in painful situations! These times of “prison” are painful and we often wonder why God permits these. When such times come however, we need to look forward to the time when the door of the prison will be opened again. These are not wasted time in God’s plans…but there are certain things we need to do when such times come if we are to see God’s hand at work and the prison doors opened for us by our Master Locksmith! Seriously how do we handle those times when our emotions become “imprisoned” and we feel trapped?” What do we do when things go so wrong that we find ourselves imprisoned in great pain physically, emotionally or spiritually? Let’s look at the imprisonment of Paul and Silas and how our Master Locksmith opened the prison door for them. Acts 16:23-26 – And when they had inflicted many blows upon them (Paul and Silas), they threw them into prison, charging the jailer to keep them safely. Having received this charge, he put them into the inner prison and fastened their feet in the stocks. But about midnight Paul and Silas were praying and singing hymns to God, and the prisoners were listening to them and suddenly there was a great earthquake so that the foundations of the prison were shaken; and immediately all the doors were opened and every one’s fetters were unfastened. Paul and Silas were thrown into the prison for casting out the demons from a slave girl who by the power of darkness was given the ability to divine. Consequently, a number of men who used this slave girl to get themselves rich by her “so-called gift” had lost their source of income and so they incited the crowd into mayhem and the authorities in order to please the angry crowd had to beat Paul and Silas and throw them into prison. The prison was a rough one. The doors were usually only locked by a wooden beam across it, thus later the explanation of why the doors were open at the earthquake. Paul and Silas were not only thrown to a prison but into a “inner prison.” That is double imprisonment. To ensure extra security, there were also stocks within the cells to hold the prisoners as an extra precaution. The Amplified version says, “He, having threw them into the inner prison (dungeon) and fastened their feet in the stocks [in an agonizing position] (verse 24). They were placed in these stocks after having been beaten and no doubt they were sore, bleeding and in great pain. At such point, many Christians would have questioned God’s love for them and why God was allowing this all to happen when all they did was minister. Paul and Silas were thrown into the prison for obeying God in preaching the gospel. Prison experience does happen to those who do the will of God. Now imprisoned in chains, what did they do? In pain and confused, they began to praise and worship God. Notice that as they sung, the other prisoners were listening to the hymns and praise choruses they were singing. They were PREACHING OUT OF THEIR PAIN. Application: At such times in our lives, what do we do? Do we act defeated, become angry with God and others? Do we pull away from God, from the church? Paul had one objective in his life – to glorify God in EVERYTHING! Though in pain, tired, abused, Paul found that his heart was not imprisoned. Silas joined him in worship. There were no questions about God’s will, about God’s goodness; there was no “why me Lord?”… JUST WORSHIP!!!! Crushing was only bringing out the “sweetest fruit” in their lives. Illustration: The ancient Roman world threshed its wheat by having two men work together. One man would stir up the sheaves while the other man rode over them in a crude cart equipped with rollers instead of wheels. Sharp stones and rough bits of iron were attached to these cylinders to help separate the husks from the grain. The simple cart had a name: It was called a “tribulum”… from which we get the word “TRIBULATION!” When great Tribulation comes to us, we often think of ourselves as being torn to bits under cruel pressure but no thresher in Rome ever used his “tribulum” for the mere purpose of tearing up his sheaves to destroy the harvest. He did this crushing to bring the precious grain in for a GREAT HARVEST! Without the “tribulum” he could not enjoy the harvest! God still works this way in our lives when “TRIBULATION” is allowed. Questions: How are you handling the “tribulation” that has come into your life? How are you handling your imprisonment? Are you singing worship hymns at midnight or tossing all night in pain and anger? 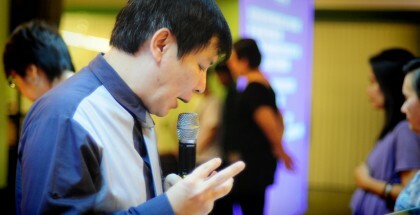 In the midst of worship, a great earthquake hit that opened the prison doors. For Paul and Silas, they were open already in their hearts. GOD KNOWS HOW TO OPEN OUR PRISON DOOR TO SET US FREE. 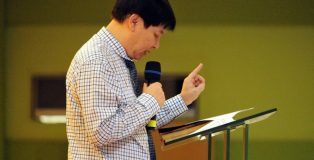 Application: There are many of us today who are thrown by Satan, evil men or even by this fallen life into the prison. We are not only imprisoned but sentenced by life into an inner prison which is a dungeon for us. There we are limited in our sight and in our movement. We are limited in all ways. The worse is the devil fastens our feet in the stocks in an agonizing position. The stocks are the chains and our chains today take many forms like the chains of tradition, chains of half-hearted service, chains of self will, and chains of no expectancy. All these chains inhibit our movement and they put us in an AGONIZING POSITION. 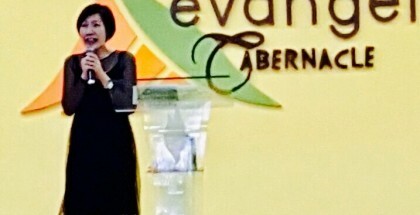 Due to such awkward position, you can’t serve God properly or even to function in your life normally. Paul and Silas were imprisoned because of the gospel. Sometimes, we do get imprisoned or trapped by being in the nucleus of God’s will. On the other hand, there are many others who are thrown into the prison with chains fastened at our feet because of the devil, evil men or even by our own foolishness. The way out is to PRAISE GOD. PRAISE turns the Master Key of our Master Locksmith and He will unlock the elements of the earth (earthquake) to shake up the FOUNDATION OF YOUR PRISON (VERSE 26) that “IMMEDIATELY ALL THE DOORS WERE OPENED AND EVERY ONE’S FETTERS WERE UNFASTENED (VERSE 26). Jesus, our Master Locksmith not only has the keys of Death and Hades, but He has the keys to open our prison doors. Let your praise turn that key! Do you ever feel like your prayers are just bouncing off the ceiling? The Bible talks about a bronze heaven – a closed heaven where our prayers cannot get through to God. “And your heavens which are over your head shall be bronze, and the earth which is under you shall be iron” (Deut 28:23). If this is our situation, we need our Master Locksmith to use His keys to open heaven for us. “Yet he commanded the skies above, and opened the doors of heaven; and he rained down upon them manna to eat, and gave them the grain of heaven. Man ate of the bread of the angels; he sent them food in abundance” (Psalms 78:23-25). The open heavens here symbolically represent BLESSINGS OR PROVISIONS FROM THE LORD. Application: When Jesus opens the doors of heaven, you will receive divine provision in the form of your basic necessities in abundance. You will be fed to the FULL. An open heaven is required for those blessings to get from Heaven’s warehouse into your own personal storehouse. Jesus began his adult life with His Father’s favor. The picture we have in Matthew 3:16-17 contains two parts – open heaven followed by the dove RESTING/REMAINING upon Him. Application: Imagine a life lived under an open heaven where God seems close, where you can feel His presence often, where you have confidence to know what the Father is saying, where heaven’s power backs you up when you pray, where God’s favor seems to REST upon your life on a regular basis and not just visit you once in a while when the church service is good or you are listening to your favorite worship song. The dove represents the presence of the Holy Spirit and we can see the result in Jesus’ life from reading the Gospels. How about you? I am inviting you today to DARE TO BELIEVE that you too can live under an open heaven and not only that, you can help to open heaven over the lives of others. What turns the keys of our Master Locksmith to open heaven? To live under an open heaven, we must understand what “Heaven’s culture” is? Revelation 5:13 gives a little picture into Heaven’s Culture. “To him who sits upon the throne” is the Heavenly Father. When we see God for who he is, unmasked and unencumbered by these fleshly bodies, we will begin to shout these four words- blessing and honor; glory and power. In Pentecostal circles we have a heard a lot of talk about “glory and power” but not so much about BLESSING AND HONOR. But these are very important words in Heaven. If Heaven is to open and God’s kingdom is to come into our lives, then we must learn their value and experience their effects in our lives here on earth. When you bless someone, they will honor you. When you honor someone, they will bless you. Satan’s original act of rebellion was actually an act of dishonor- he wouldn’t acknowledge God’s sovereign place – the dishonor becomes rebellion (Isaiah 14). In what ways can we bless and honor God? Our obedience to His Words and Commands, like tithing. That is the highest blessing and honor we can give to God. The lack of giving honor through our DISOBEDIENCE is the reason for heaven closing over that meeting. E.g. A stark example of HOW IMPORTANT honor is with respect to living under an open heaven is recorded in Matthew 13:53-58. Verse 58 tells us that Jesus was restricted by the people’s unbelief. But if you read the immediate context in verses 53-56, the REASON for the restrictive unbelief was that they FAILED TO PROPERLY HONOR WHO JESUS WAS. The lack of honoring Jesus was offensive to the heart of the Heavenly Father and even Jesus couldn’t call down heaven’s power at that point because he could only do what He saw His Father doing. We must understand that the lack of honor shuts down Jesus’ work because the Father loves honor and when we give proper honor, He opens heaven. Also note that it was family, friends and neighbors who did this to Jesus. This shows us that the giving of honor to those closest to us has an individual effect and a corporate effect upon the amount of presence and power that will flow in our services, in our families and in our individual lives. Therefore, our giving of the blessings and honor to the Father through our obedience turns the keys of our Master Locksmith to open the doors of heaven to rain down his divine blessings and provisions upon our lives. Application: Have you been giving honor to the name of your Father by living a life of obedience? The highest blessing we can give to our God is our lives of obedience and that is the highest honor we can pay Him. That resonates with the culture in Heaven. Jesus, our Master Locksmith not only has the keys of Death and Hades, but He has the keys to open the doors of heavens. Let your God-honoring lifestyle which is obedience turn that key! This passage in 2 Kings 6 is all about SEEING. An aggressive invading foreign king, The King of Aram, keeps getting his plans thwarted because someone (Elisha) keeps SEEING his plans and tipping off Israel. That king then goes after Elisha and surrounds him with army to try to capture him. Elisha’s servant is worried and so Elisha prays for the servant’s EYES to be open so that he can see the hosts of heavens armies protecting them. He then prays for the invading army to be temporarily BLINDED and leads them to the heart of Samaria and then prays for them to SEE AGAIN. They open their eyes and see their impending doom but instead receive mercy and a feast. They SEE a God who deals with them in grace and get so transformed that the conflict completely stops. Many of our spiritual eye gates are closed and we couldn’t see into the spiritual realm. If the spiritual gates of our eyes are closed, we will then see things and life from the perspective of our limited human vision which will result in fear like it does to the servant of Elisha. After the prophetic prayer by prophet Elisha, the LORD opens the eyes of the servant and he is able to see into the spiritual realm – the hosts of the army angels of God surrounding Elisha. God gives the gift of the Prophet to His people. They are sometimes called “seers” because they see things God shows them. God gave Elisha in this passage supernatural knowledge of the King of Aram’s whereabouts and plans. Whilst Old and New Testament prophets are different, they both reflect Jesus, the Ultimate Prophet (Hebrews 1:1). In the New Testament era, all Christians can prophesy (1 Corinthians 14:21) but some are especially gifted in this area (Romans 12:6). Application: Elisha used God’s gift to serve a king without that gift. We need to use our prophetic gift constructively, “to encourage, edify and comfort” (1 Cor 14:3). Elisha SAW what was good for Israel and the King and he encouraged the king to take different routes, comforted the king that God wanted to save his life. He strengthened Israel. Bring your gift, submit it to godly leadership in the church and share what you see. The servant of Elisha finds himself in an “oh no” situation. An army with horses and chariots has surrounded them – you might call him a Realist. But he is actually blinded of greater reality. Elisha can see the angel’s armies but the servant can’t. Elisha has the EYES OF FAITH while his servant hasn’t. Application: Eyes of faith are eyes opened by the Master Locksmith to understand the nearness of God’s presence. Eyes of faith trust even when they don’t see with their physical eyes. Jesus’s disciple Thomas missed church one week and missed Jesus resurrected appearance. In response to Thomas’ subsequent doubt, Jesus said, “Blessed are those who have not seen and yet have believed” (John 20:29). “Do not kill them,” he answered. Would you kill those you have captured with your own sword or bow? Set food and water before them so that they may eat and drink and then go back to their master.’ So he prepared a great feast for them, and after they had finished eating and drinking, he sent them away, and they returned to their master. So the bands from Aram stopped raiding Israel’s territory” (verse 20-22). Elisha leads the enemy into the heart of Samaria. Their EYES are opened. The horror! They’re trapped. The king says, “Justice! Kill them!” But Elisha stands in the way and says, “Let’s show grace.” Grace is always more powerful than justice. Application: God wants to open our eyes today to His grace. Many people have a view of God that he is fault-finding. The truth is so much harder to hear: our sins are much bigger than we could ever imagine. But wonderfully His grace is bigger still and much more powerful than we could ever imagine. He forgives; He reconciles; He heals; He loves. Don’t settle for a view of God as just the Judge. He is a Father who loves you. Let God open your eyes to His grace. Elisha lives not just by what his five senses inform him but by what God shows him. Many of us are living in fear because we see the world, our lives and our battles with the wrong vision or through a colored lens. The Master Locksmith today has the keys to open the gates of your eyes to see into the spiritual, into the heavenly, into the invisible and into the prophetic. Jesus, our Master Locksmith not only has the keys of Death and Hades, but He has the keys to open our eye gate. Let the prophetic anointing turn that key! The word “heart” appears well over a thousand times in the Bible and it is a metaphor for THE INNER SELF as a whole. Revelation 3:20 describes our heart as having a door and it places the choice to open or close that door on us. Jesus is pictured here as one standing at the door of our heart and knocking. If we have a closed heart, we won’t open the door but if we have an open heart, we will be able to hear the voice of Jesus and opens the door and He will come in to our heart and eat with us. A closed heart is one whose door is shut. Closed heart is the condition that separates us from God. A closed heart carries symptoms like blindness, limited vision and self-absorption. A closed heart lacks gratitude and is insensitive to wonder and awe. A closed heart forgets God and loses track of the mystery around us. A closed heart lacks compassion and is insensitive to justice, peace and love. A closed heart is a hardened heart. It affects our well- being. It affects our faith and shuts God out. Is the door of your heart closed? E.g. Nebuchadnezzar was one king whose heart was so closed and hardened. He was a prideful and arrogant king. Despite the many warnings God gave him concerning his prideful heart, he disobeyed until God struck him down to live like a beast in the wet field for seven years. He lived in insanity until he “learned that the Most High rules the kingdom of men and gives it to whom he will” (Daniel 4:32). After his sanity was restored, Nebuchadnezzar declared, “Now I, Nebuchadnezzar praise and extol and honor the King of heaven; for all his works are right and his ways are just; and those who walk in pride he is able to abase (verse 37). God is greater than our hearts (1 John 3:20) …. not our arrogance or even our condemnation. Application: The world feels like a pretty harsh place these days. Violence is all too common. Disagreements are mean-spirited and far from civil. People are so deeply rooted in their mindset, so sure that they are right about everything. We have closed our hearts. It is affecting our vision and our mental peace. We can’t seem to come together. It is overwhelming. If our hearts today are hardened and closed to the voice of Jesus, God will humble our proud and closed heart till we recognize his authority and sovereignty. Paul’s heart was so closed to the gospel till Jesus appeared to him and humbled him by striking him blind. Proud Paul had to be led by hand into Damascus to be prayed by Ananias before he could see again. The Master Locksmith usually used the key of humility to open our hearts to him. E.g. It is amazing to see our Master Locksmith use the key called adversity to open the doors of hard hearts unto Him. I will never forget how one mum threw the bags of one of our members at the ground floor of Quezon. She “disowned” our member for being a “born again.” We had to shelter that persecuted member at our Mission School for a while. That was so many years ago. Today, that mum who was hardened against Jesus is now in our church and I even saw her helping out at the medical mission at Simon Ledesma. How did the Master Locksmith open her hardened heart? Through adversity. The eldest daughter sustained a rare disease and died and the Master Locksmith used that pain and humbled state to open up the door of her hardened heart. Our Master Locksmith specializes in opening up the doors of hardened hearts. Application: What is the state of your hearts today? Have you allowed harshness and unfairness of life and the unexplainable of life to harden your heart? Humble ourselves before Jesus. Our humility will turn the key of our Master Locksmith. But of opening the heart’s door. Application: There are some of you who have locked up your heart up in resentment, dejection, condemnation and rejection. The Master Locksmith is waiting at the door of that closed heart and knocking. Can you hear his voice? Anytime you are willing, he will open the door of your heart and come in to change your stony heart to one of flesh. Jesus, our Master Locksmith not only has the keys of Death and Hades, but He has the keys to open the doors of our hearts. Let your humility turn that key! Hundreds of others added in their complaints and pain, each complaining that God permitted evil and suffering in the world while He enjoyed the comforts of Heaven where there was no fear, no hunger, no pain and no hatred! They all complained that God knew nothing about all this and with His sheltered perfect pain-free life could not sit in judgment on them. Each group chose a leader to represent them to come up with a plan to make God suffer. There was a Jew; there was a black man; the untouchable from India; an illegitimate person; a victim of Hiroshima and one from a Siberian slave camp. Let Him try to communicate God to men who aren’t interested. He would have to be betrayed by His dearest friends! Let Him be indicted on false charges, tried before a judge that was prejudiced, including a prejudiced jury… and then be convicted of being guilty even if He isn’t! Let Him see what it is to be terribly alone and completely abandoned by every living thing! Then let Him be tortured and die, and to die a humiliating death with common thieves! As they pronounced their plan for God’s punishment and the entire crowd jeered… they suddenly became silent! No one uttered a word, no one moved, for suddenly they all remembered, God had already served this sentence… in the person of Jesus Christ!!!! Jesus has gone through every facet of that “locked up” life. He became imprisoned at the cross; even being thrown to the inner prison/dungeon called Hades so that by His total serving of this death sentence for us, he could secure for us the Master Key to unlock even the doors of Death and Hades to set the captives free. Whoever dares to have faith in His finished work on the cross, can have access to this Master Key to be released from eternal death and hell; from our own prison, our closed eyes, our closed heaven and even our closed hearts. Today, the Master Locksmith has given you his contact number. All He needs is one call from you. Turn the key of the Master Locksmith to open your prison door through your praise. through your God-honoring lifestyle – obedience. 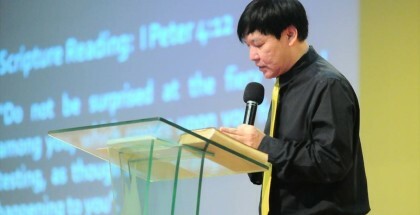 to see into the realm of faith through the prophetic anointing. Turn the key of the Master Locksmith to open the door of your heart through your humility. Isaiah 61:1-3 – “The Spirit of the Lord God is upon me, because the Lord has anointed me to bring good tidings to the afflicted; he has sent me to bind up the brokenhearted, to proclaim liberty to the captives, and the OPENING OF THE PRISON to those who are bound; to proclaim the year of the LORD’S favor, and the day of vengeance of our God; to comfort all those who mourn.